You've probably heard the phrase, not all products are alike. So is the case with Muggy Weld. Back in 1988 we were trying to join thin 1930 vintage aluminum on an important body panel, all methods available at the time were failing due to the age of the aluminum. After months of research, Muggy Weld was finally consulted and their Super Alloy 5 was used to solve the problem (unfortunately we are unable to provide photos). Chris: How did Muggy Weld get started? When was it started and where is it located? Mike: Muggy Weld began in 1988 after researching various products on the market. It began with selling our Super Alloy line. At the time, it was sold mainly through direct sales to industry professionals and trade shows, and our products were not available to the general public. In 1997, I rebranded our products and launched our first website, Muggyweld.com. We are currently located in Olympia, WA. Chris: What products does Muggy Weld offer? Chris: What makes your welding products different from other products? Mike: Let me go over our products to give you an idea of what their purposes are. Super Alloy 1 is a Solder with a melting point of 350 degrees F. It works on pot metal at half the temperature of the melting point of pot metal and is a few thousand PSI stronger, meaning you can join two broken pieces with decent strength. It also can join ferrous to non-ferrous metals. We have customers Frenching pot metal taillights into steel panels. Super Alloy 1 will work with any torch or heat source used for soldering. The product solders to all white metals including pot metal, zinc die cast, aluminum, galvanized metal, zinc coated metal, and pewter as well as copper, brass, bronze, steel and stainless in any combination. Super Alloy 5 can braze or solder through most contaminates found under the hood. The flux washes away grease and oil while brazing. I've taken old A/C condensers that have never been cleaned, poked a hole in them and made repairs in less than a minute during demonstrations in shops across the country. The Super Alloy 5 works on all grades of aluminum as long the aluminum content is at least 50%. When working on cast aluminum an oxyacetylene torch is needed, particularly when working on large or thick aluminum jobs due to the heat dispersion of aluminum. SSF-6 Silver Solder is our highest reordered rod. This rod makes the beginner look like a Pro. Its flux is one of a kind. The 56% solder brazes stainless, copper, steel, chrome molly, cast iron, cast steel, bronze, brass, German silver, copper-nickel and even burnt stainless steel in any combination. We get a lot of calls for joining copper to stainless in various industries and this rod will make easy work of this kind of work, while providing a pharmaceutical, medical and food grade joint. Our SSQ-6 Silver Solder Paste comes in a 1 ounce syringe and is usually applied before the parent metal is heated. The SSQ-6 is rated at 80,000 PSI and is fantastic for male-female work or when sandwiching two metals together. It's also great when working on small to very small applications where only a dot of material is needed. For ease of use, the "rod" is in powder form premixed with a flux. The SSQ-6 works on all the same metals and alloys the SSF-6 does. It has a shelf life of up to 9 months when kept refrigerated. Cool Blue Heat Paste is a heat sink that is completely reusable when kept clean. How much a customer uses per job isn't critical, since it can be reused. 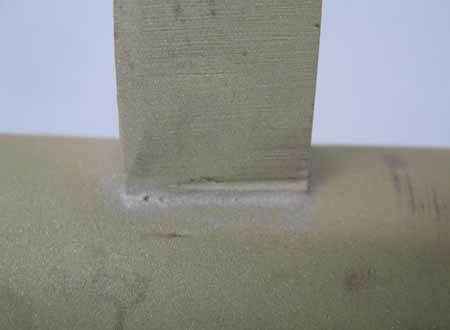 Cool Blue Heat Paste slows or completely stops heat transfer next to plastic, wood, paint, chrome, a previous solder or any work where heat control is an issue. It can also be used to keep thin metals from warping while welding and soldering. Our pot metal repair customers use the Cool Blue to prevent remelting of solder when soldering two broken pieces of pot metal. Repair one side, flip it over and lay the soldered area on the heat paste to repair to opposite side. If the product dries out just add some water and mix it in for the next job. 72 Cast Iron Electrodes are designed for heat affected cast irons like exhaust manifolds, wood stoves and oven grates. It will anchor into hard-to-weld cast or where other rods cannot. The 72 is usually applied in a cladding fashion. 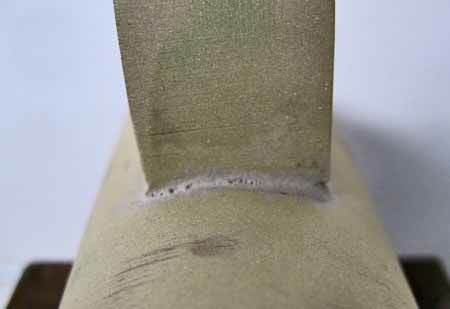 Weld the 72 as a root weld and finish with the our 77 rod for crack resistance and machineability. It will also weld cast iron to mild steel. Our 77 Cast Iron Electrodes are the rods of choice for most cast iron applications. The 77 is unique among the nickel rods on the shelves today as the end result is fully machineable. Many of our customers use this rod as a TIG rod, some keep the coating on the rod and others will soak the rods in a bucket of water for up to 10 minutes to remove the coating. 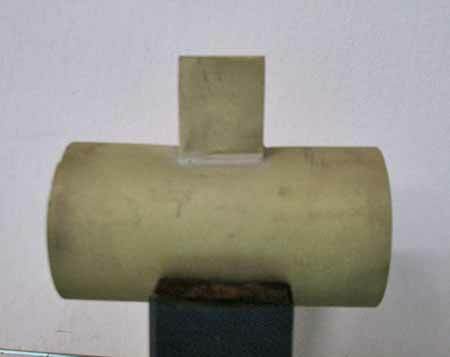 When compared to typical nickel rods, this electrode is not hard and brittle and boasts a 300% elongation. Like the 72, the 77 will weld cast iron to mild steel. Chris: How would you define Muggy Weld's business philosophy? Mike: We want everyone to have access to the same tools industry professionals use, allowing the home user or hobbyist to make professional quality repairs at a reasonable price. Chris: Who are your customers? What business categories do your customers represent? Mike: Our customers range from repair shops to home hobbyists to industrial manufacturers to government agencies. We really see a wide variety of customers, because our products are unique and facilitate repairs most rods cannot. Chris: What about inexperienced welders. Can your products be used by people other than the professionals? Mike: Definitely. In fact, we are currently posting a series of videos showcasing Tawny, a first time welder, utilizing our products. We believe it is important to show real life applications with inexperienced welders, so viewers can see a typical first time result. Tawny is guided through each process and given tips and techniques any viewer can find helpful when trying our products for the first time. You can find our videos at http://muggyweld.com/videos/beginner-videos. Chris: Anything else you'd like to add? Mike: I learned how well our welding, brazing and soldering products worked when I demonstrated them in maintenance shops across the country. Guys would say, "I don't want to see a demo on stuff you brought in, I want to see it on metals in my junk pile." So I used their torch on their parts and pieces and learned quite a bit more about how fantastic Muggy Weld products performed. I remember working overhead in a transmission shop on a Mitsubishi 3000. A kid took his dad's new car for a jump, Dukes of Hazard style and cracked the aluminum Transmission. I used Super Alloy 5 and an oxyacetylene torch to repair the hole/crack even while the fluid was dripping due to heating the part. I think we saved that kid some harsher punishment and the shop didn't need to stick the dad for a new transmission. I walked into a welding shop in Portland Oregon, and joined copper to aluminum to brass with the Super Alloy 1 with a propane torch. The owner said he's been welding for 50 years and said this is impossible while holding the finished piece in his hand. I said you're right with any other product you cannot, he said no you can't do this, I looked at him and realized he was not going to believe his own eyes, this must be a trick or something. It took him one week with this piece sitting on his desk to wrap his mind around the fact that it actually worked, he then called Muggy Weld to place his order. I was just telling an associate the other day I have forgotten way more stories than I can remember as I'm used to watching the so called impossible happen on a daily basis. I would not have continued selling welding supplies if I was only competing with prices rather than product. Seeing the reaction on people's faces and hearing stories from customers about how they repaired cast iron engine blocks and one of a kind pot metal parts they were told to throw in the trash by welding companies in their town keeps me wanting to do this until I grow older and greyer. Chris: Where can someone learn more about Muggy Weld products and purchase them? Mike: Our Website is the best method to learn about our welding products, either reading literature or viewing videos. Welding products can be purchased through the website or by calling the toll free phone 1-866-684-4993. Author's own experience with the SSF 6 Silver Solder is shown in Photos 1 through 4. Welding cast iron is also documented in SCG article Welding Cast Iron. 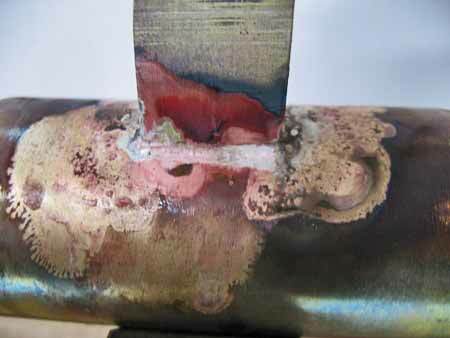 Photo 1 — Shown is a piece of 3/4 X 3/4 inch brass solid stock on top on a 1-1/4 inch brass thick wall tubing and silver soldered with Muggy Weld SSF6. The solid stock was ground (rounded) to the tubing shape to form a tight fit against the tubing. The solid stock was securely clamped to the tubing during the soldering. Heat was applied to mostly the square stock and the SSF6 flowed well under the solid brass stock, exactly where it should flow to make a nice soldered joint. Photo 2 — Shown is the same square stock after cleaning with a wire wheel and light passes in the blast cabinet. Photo 3 — Close up view of the soldered joint. Notice how thin the soldered joint flowed between the pieces. Photo 4 — Close up view of another soldered joint. Although the square stock was tightly fitted to the brass tubing, the SSF6 flowed under well into the joint, filling even the smallest gaps.